Tai Chi Chuan is an ancient Chinese art with deep roots in traditional Chinese culture. 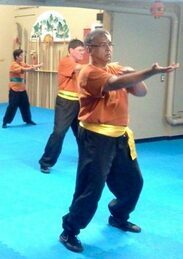 It is first and foremost a martial art, drawing on older fighting styles and techniques that were refined and combined with the Tai Chi philosophy. Many people believe that Tai Chi and Tai Chi Chuan are the same thing, but in reality they are not. Tai Chi is a Chinese philosophy that has been around in China for over 4000 years. Tai Chi Chuan is a Chinese martial art style based on the concepts of the Chinese philosophy Tai Chi and it goes back only around 1000 years. As of recently, many people are practicing Tai Chi Chuan, as it is getting the medical field attention as one of the better ways to improve your energy, balance, muscle tone and health in general.